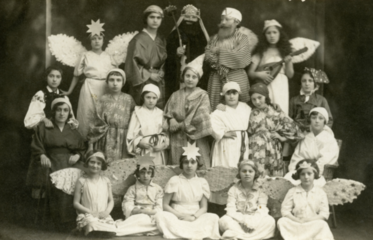 Bais Yaakov, founded by a seamstress in 1917 in her sewing studio in Krakow, Poland, grew within a remarkably short time into an international network of schools for Orthodox girls that continues to function today. This talk will explore the founding of the school, focusing on its distinctive character as “a revolution in the name of tradition.”Naomi Seidman is the Chancellor Jackman Professor of the Arts in the Department of Religion and the Centre for Diaspora and Transnational Studies at the University of Toronto. She received a 2016 Guggenheim Fellowship and was the 2016 NEH Research Fellow at the Center for Jewish History. Her books include: Faithful Renderings: Jewish--Christian Difference and the Politics of Translation (2006), The Marriage Plot, Or, How Jews Fell in Love with Love, and with Literature (2016), and Sarah Schenirer and Bais Yaakov: A Revolution in the Name of Tradition (2019). Basya Schechter, a newly ordained Aleph Cantor (Class 2016), is most known for her group, Pharaoh's Daughter, a 7-piece world music ensemble that travels effortlessly through continents, key signatures, and languages with a genre-bending sound. Basya Schechter’s earthy, soulful beautiful voice rings out over instruments that form a vibrant collage of East/West, Ashkenaz a vision of a new Middle East. She is also the musical director of Romemu a fast growing progressive spiritually adventurous community in the Upper West Side. In the summer she is a cantor for the Fire Island synagogue, a smaller flip flop wearing community, co-led with banjo playing Rabbi, writer and academic, Shaul Magid. Her prayer project "Dumiya" (7th album) was released in 2014, and a collaboration with rapper Eden Pearlstien aka EPryhme called "RAZA" was released in 2017. The 33rd Annual Joseph Alexander Colloquium is sponsored by the Joseph Alexander Foundation and the Mackler Family, cosponsored by the Jewish Studies Program, the Program on Gender, Sexuality, and Woman’s Studies, and the Department of Music. Contact the Jewish Studies Program at 215-898-6654 or chwalsh@sas.upenn.edu for more information. No RSVP necessary. 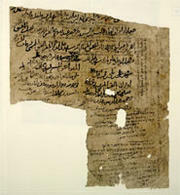 (Genizah) [Account note page of an India trader]. [Fustat, ca. 1152]. Notes of Abraham ben Perah#yaben Yiju, an India trader, upon his return to Fustat from India and Yemen, with his Indian slave/agent Bama (Bomma).